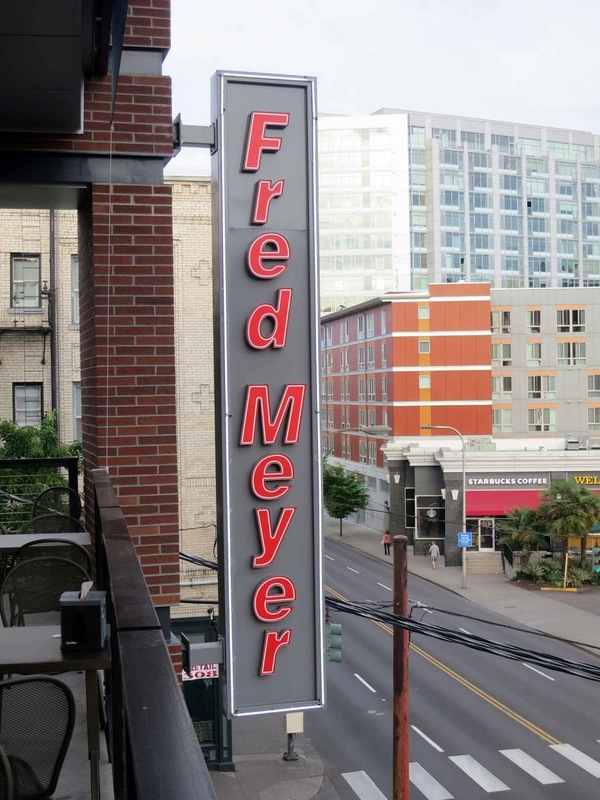 For a very long time now, tucked into the tony area around NW 20th Ave and West Burnside Street, there's been a Fred Meyer store … the Stadium Fred Meyer. 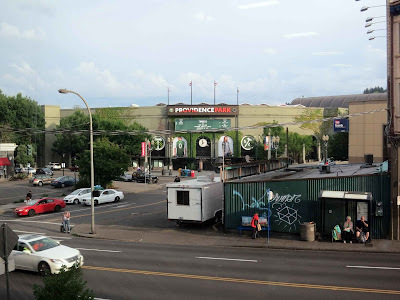 Adjacent to what we now call Providence Park, which was called Jeld-Wen Field, which was called PGE Park before that, the structure was once known as Civic Stadium, a rubric I still think of it as. Too, the Stadium Fred Meyer store has been through an immense amount of change. It's recently completed a re-re-re-invention, and is quite a comfortable place to watch the city go by. It has comfortable places to take your food you just got from the deli and look over the intersection of 20th and W Burnside. 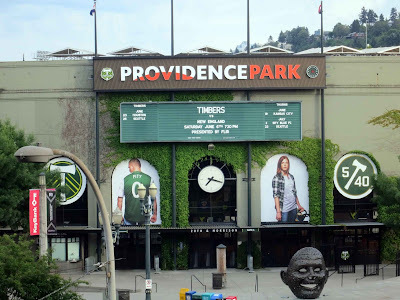 And it frames the 20th/Burnside gates to Providence Park handsomely - and somewhat intriguingly. There's a dystopian vibe in the way that low tin structure (with two of our ubiquitous street-food trucks in front) kind of distresses the view. Kind of like a scene out of Soylent Green, but with much, much fewer people. The gates to the gladiatorial arena we love so much. The Timbers do an interesting thing. They get fans to pose for pictures every year and the best go on billboards and such. The fellah on the left of the clock has a rather witty jersey which tells you how much pity an opponent will receive in an ideal match. Ideal matches don't always happen, of course; that's why sportswriters are still so important. The 5/40 logo is all about team history. In 1975, the Timbers heralded the coming of Soccer City USA, and that's been 40 years. 5 years ago, in 2010, the Timbers joined the ranks of MLS. History. There's always more of it. And I actually love the way a football club can make abstruse symbolism out of it all. Portland's love of soccer seems very European in this regard. Immediately west of this intersection is a wedge-shaped block bounded by SW Morrison Street, 20th Avenue, and West Burnside. That building above is one of my favorites. 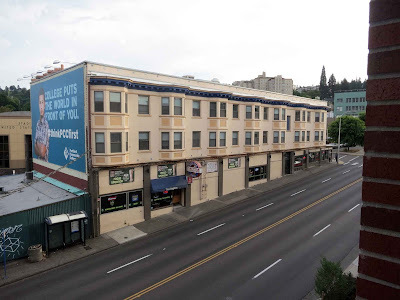 The lower floor is the Kingston Saloon, a long-time fixture in the nabe and, as one can see (and cannily so), a local headquarters for Timbers fans on match day. The city grid south of West Burnside from the river to about 21st Avenue is canted to follow the river. The grid north of that aligns pretty close to the North Star (which is why it's tilted ever-so-slightly off plumb). The collision of the two grids results in a fun, interesting pattern, dog-legging streets and wedge-shaped blocks which makes for a singularly-interesting place to roam. It's long been one of my favorite parts of town for this reason. My favorite signs are the non-standard ones. And, a big no-no in design is stacked type, but there are places where it's appropriate. Here, for instance. Fred Meyer's type style has changed over the years, but in the modern age, it's always been italicized, bolded, and red. It's a familiar approach and comforting … Fred Meyer has essentially been Kroger West for quite a while now, and just to show I'm not throwing too much of a shade on them, I'll give them credit for maintaining the look, feel, and atmosphere of an honored, Oregon-born-and-bred brand name. Portland without Fred Meyer really wouldn't be Portland anymore, would it? Kroger seems to understand this. That's responsible brand stewardship I can respect. Photo by The Wife™; one of inner Portland's ubiquitous streetlamps … now, as I've said many a time, I was born in Silverton and spent the majority of my teen years in Salem. 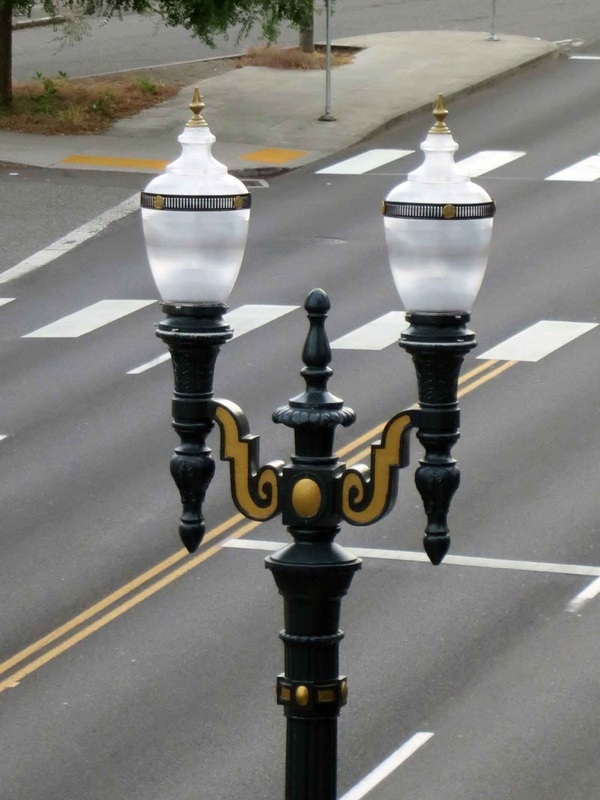 Portland's always been a little more proud of its patina of age than cities down state, and for me, the wonderful streetlamps exemplify that. It might not be Portland's signature … but it could be one of them. Sunday afternoon, May 30th, 2015. Dateline, Portland, Oregon … my home town.